With a house full of buns needing veggies, things usually go fast. Keeping veggies as fresh as possible for as long as possible will help both humans and long eared friends eat better. We picked one of these up at our natural foods market and were amazed; it's usually the type of thing I wouldn't even try, but I'm so glad we did! 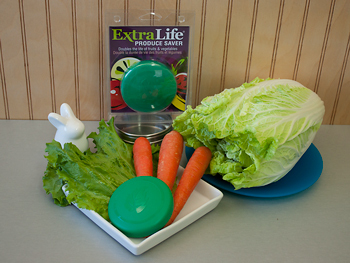 Each disk lasts three months, and I know we saved a large multiple of that in veggies that didn't wilt and go bad!